I used to be a better blogger. I wrote more often, and sometimes I was even amusing. These days, I can’t seem to get myself together to string a few words into a post and that makes me crazy because so much as happened since I last posted, things that all warrant a post of their own and here I am writing a Thursday Ten and let’s face it, a bullet point for these things is just not even enough. Working backwards, most recently been dealing with the stress of my brother being quite ill, in the hospital and intubated, unable to breathe on his own. I can start with this because yesterday they were able to take the tube out and he was able to breathe on his own, though he is raspy, coughs a lot, and is quite pissed at the world. (He also really would like to eat something but… yeah, that’s going to be awhile.) Not sure how he got so ill, and I’m not sure how it got so bad… but it was bad and now he’s on the mend, and there are probably some things that will have to change for the sake of his health. Scary things aren’t good – but I’m glad that at the very least, it might bring about some much needed change. I found out my brother was so ill on our way back from Chicago where we had just seen mother-freakin’ HAMILTON. It was absolutely everything EVERYTHING I dared hoped it would be. I am so glad to have gotten to share that with the girls and Chris. It was magic. You know what else, y’all? I ran a half marathon! It was difficult and kind of scary, but I did it. I cried when I crossed the finish line. (I’m doing a lot of crying lately) I just was so damn proud of myself. I can do these things. I can set these goals. So… I signed up for another half. I’ve got five more months to train for it, but even though I thought I was “one and done,” I’m totally doing another half marathon and that just kind of blows my mind a bit. And then I signed up for a ten miler, too, because the timing was perfect so why the heck not? NOTHING CAN STOP ME NOW. Before THAT? I went for my yearly appointment with the amazing team in Iowa and…it was good. Better than I could have hoped. See, you guys. There’s been so much stuff. And now the school year is almost over, my kid turns 15 in just over a week, and I’m a freaking half-marathoner, and you’ve missed it all because I’m not a good blogger. But. I miss writing. I have to do this more often. I do. 1. I haven’t posted much lately – and it’s not because I have nothing to say – it’s never because I have nothing to say. I have tons to say. I just don’t know how to say it. And sometimes I feel a bit negative. Okay, a lot of times I feel a lot negative. I’m sure that’s normal but it’s not the happiest feeling in the world and it’s hard to write about and y’know, it is what it is. 2. And so somehow we’re almost in the middle of July and how the heck did that happen? This summer is flying and before I know it, we’ll be stuck in February under three feet of snow. 3. The girls are with their dad this week – it’s always hard to adjust to the times when they’re not here. Miss them like crazy. The workweek has been absolutely bonkers so I’ve been going in early and trying to make a dent in my project list – which helps, but… I’ll be glad when they come home. It’s an adjustment – the summer schedule. I guess the good news about it being halfway through July almost is that in a month and a half, the normal schedule will be back. 4. I have hit the realization lately that I’m really bad at some of this being-a-grownup stuff. Stuff like budgeting for home renovations. I keep saying to myself, “UGH I want to get rid of this living room carpet.” If I had just started saving when I first started having that thought, I bet I’d have saved enough to actually do the freaking project. Here’s to actually setting up savings accounts and planning for all the things i want to do – things like hardwood flooring and Spain. 6. After a week of “Watch Me (Whip/Nae Nae)”, I’m wondering just how many gymnastics floor routines this season will feature the Whip. Apparently two, so far. 7. My eyebrows are in dire need of waxing. 8. For the past two days, I have had my air conditioning off and my windows open and it’s just absolute bliss. I know people are ticked because this doesn’t feel like summer, and it’s too cold for pools – to which I say TOO BAD FOR YOU! THIS IS MY BRIEF BIT OF HEAVEN. 9. Things I’ve bought this week that I love: The Skinnytaste Cookbook: Light on Calories, Big on Flavor and Joy Williams – VENUS . Neither of these is a paid or sponsored review – these are things I saw and wanted and purchased with my own moohlah. I haven’t made anything out of the cookbook yet – but there are so many great looking recipes (lots of yummy latin-inspired recipes so I’m stoked!). And Joy Williams – I know there’s quite a few bloggers doing reviews of her stuff, but I decided on my own to purchase her album because I have loved her voice and The Civil Wars and I have basically been humming the whole album for days. Good stuff. 10. The good thing about Thursday is that it’s almost Friday. Have a good one, y’all. I just sliced a mango, so juicy that as I held the fruit steady, its juice ran from my cutting board. So ripe, I put the knife down and pulled chunks of the fruit apart, tossing them into a ceramic bowl. When I finished, I grabbed a mango chunk from the bowl, popped it into my mouth – refreshing and sweet. I washed and dried my hands, then poured the mango from the bowl into a plastic zip top bag and threw it into my freezer. I eat a lot of mango lately. I’ve never been a smoothie person and now I make smoothies all the time because vitamins. I need vitamins. Nutrients. Goodness. 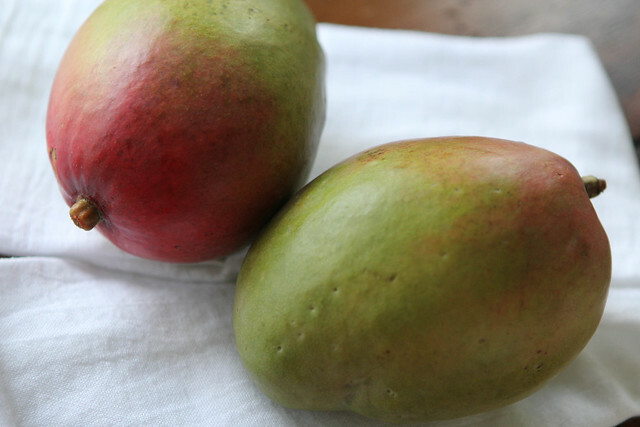 Mangos are rich in vitamin A. Avocado contains lutein. Also, supposedly it helps turn the carotenoids of the mango into active Vitamin A.
I don’t know if it really helps anything, but at this point, I also figure… what could it hurt? I was recently diagnosed with a degenerative retina disease. I was probably born with it – it’s a hereditary disease that no one in my family seems to have. We’ve traced back – we can’t think of anyone else who has it, but to be honest, i don’t really know how far back we went. It’s autosomal recessive which is a fancy way of saying, I received one copy of a mutated gene from my dad, and one from my mom – they were both carriers so they each had a good gene and a bad one… and I got the messed up ones (yay me). It means that there’s probably been generations of carriers of this gene, but they just didn’t have the dumb luck of genetics. I had never heard of it before this year. The diagnosis has hit me a bit like a ton of bricks and on some days I feel totally normal and I don’t think of my eyes at all and on some days, I find myself sitting on the floor of my mudroom crying because I don’t know what the future holds, and all I can see is a future of worst case scenario. The reality is my night vision and peripheral vision will progressively worsen. To what extent, no one can say for sure. But I know what the worst case scenario is and in my scared moments, in my vulnerable moments that is the place where my mind goes. To the worst place. I shut my eyes sometimes and I imagine a world where the scenery is gone and if I let myself stay in that place my heart will break in half and it takes awhile to unthink those things and so I try sometimes to just pretend that everything is okay. I am trying very hard to be hopeful and I am told and I have read that there are tremendous advances being made in medical research. I am told that there will be treatments in my lifetime; I’ve even been told that there could be cures in ten years. And that’s what I need people to remind me: to have hope when I don’t feel hope, and to believe that everything will work out the way it’s supposed to be. I know that they say that things happen for a reason, and I’m not necessarily inclined to believe in that cliche – because for me, the reason is just dumb luck. Genetics. Nothing that anyone could do anything about. And all I can do is wait. Look for my new normal. Feel sad when I feel sad. Feel angry when I feel angry. Ignore it all and bury it deep when it’s too much to deal with. And in those moments when I feel empowered, in those moments where I tell myself that this will not defeat me, this will not define me, and I am stronger than all of this and I will get through this. I will make a difference. I wish there were more empowered moments and less grieving moments. I eat a lot of mangos lately. More avocados than ever in my life. To tell Congress to support vision research, click here. There is so much amazing research being done; research that can maybe help me someday. It needs funding. Contacting your state’s folks really couldn’t be easier, click through – I guarantee it will take less than two minutes. If you’re able, consider a donation to the Foundation Fighting Blindness to support research and programs to fight blindness.